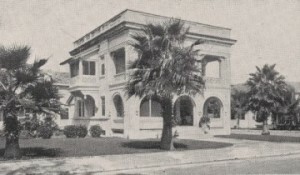 The first poured concrete home in the City of Miami was located at the southwest corner of NE Second Street and NE Third Avenue. The home was built by one of Miami’s earliest pioneers and most active promoters of the city after incorporation. Edwin Alexander Waddell was born in Canada and migrated south until he reached Key West in 1886. During a trip to Palm Beach by boat, Waddell and his brother needed to stop to repair a sail. As luck would have it, their emergency required them to make a stop at the mouth of the Miami River. Shortly after the incorporation of the City of Miami, Waddell stayed in Julia Tuttle’s Hotel Miami while looking for a permanent residence. He had a home in Lemon City, but wanted to be closer to real estate interests he owned just north of today’s eleventh street in Miami. The cover photo was a picture of the Waddell home in 1915. Waddell constructed the first poured concrete home in the late 1890s. The home remained standing until the mid-1950s. The building on the former location of Waddell’s home was built in 1979. It is a three story commercial structure. Many of today’s downtown residents may know it as the building where Elwood’s Pub is located. See Figure 1 for a picture of the building on the southwest corner of NE Second Street and NE Third Avenue. Read more information about E.A. 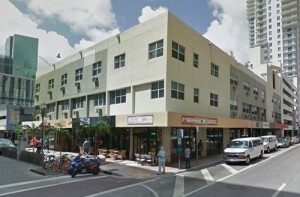 Waddell at the Miami History Blog.